It’s officially a series now because there’s 3 of them, so I gave them their own tag. I’ve made up some more blanks for different ones, greens and reds, so expect a few more before I get tired of painting them. 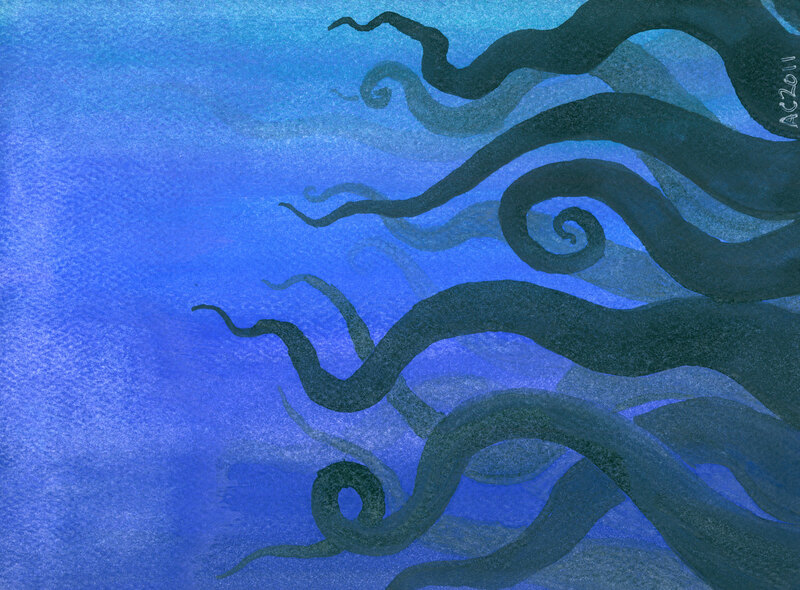 This one was a different sort of paper, recycled watercolor greeting cards, and I painted over the faint image with rich, opaque Japanese sumi-e inks. I let the paper mostly dry, and then made a mixture of black and green. 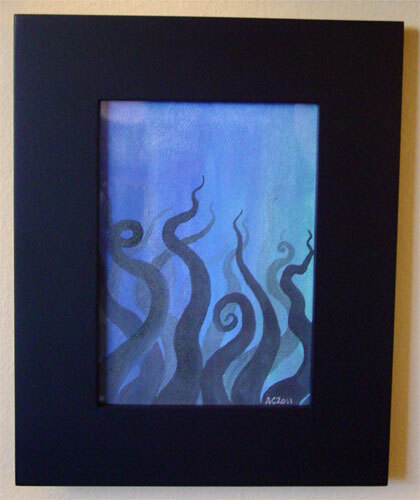 Between the paper and the wetness of the inks, the tentacles tended to pick up on the color beneath more than the previous two pieces, giving them a faded feeling. 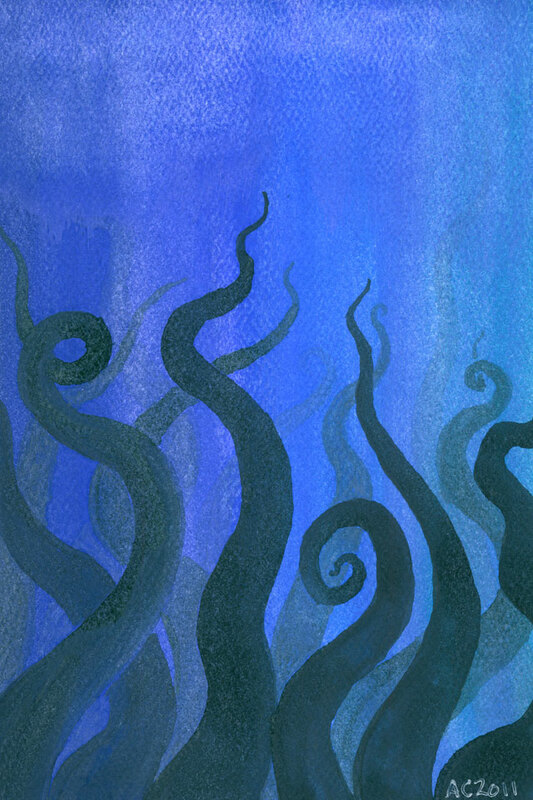 I also shaded the paint using blue-violet to blue-green from left to right rather than vertically shading from light to dark, and covered the whole page rather than leaving a white border, so the whole piece has a slightly different feel to it than the others. 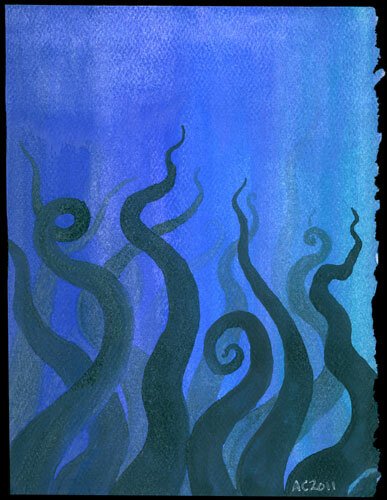 Tentacle Deeps 3, 5″x7″ ink and watercolor on watercolor paper. I also made another computer wallpaper and iPhone wallpaper for this one — please let me know if you download them.